Author(s): Kam L. Hon, Department of Pediatrics, The Chinese University of Hong Kong, Prince of Wales Hospital, Shatin, Hong Kong. Michael H.M. Chan, Ming H.J. Ng, Chi C. Ho, Kathy Y.C. Tsang, Wing H. Tam, Chung S. Ho. Objective: Maternal drug abuse may influence neonatal outcomes. We compared neonatal outcomes of patients with urine screened positive for commonly abused drugs (CAD) versus those who were screened negative, and reviewed the pattern of drugs detected at a university teaching hospital. Methods: Urine samples collected from babies with suspected illicit drug exposure who were admitted to the neonatal unit were sent for comprehensive drug screen (CDS) performed by liquid chromatographytime- of-flight mass spectrometry (LC-TOF/MS). The screening library can detect more than 300 drugs and their metabolites. Fluorescence polarization immunoassay (FPIA) was also used to screen for cannabinoids which were not detected by the present LC-TOF/MS method. Symptoms suggestive of drug exposure and history of maternal substance misuse were recorded. Results: Commonly abused drugs (CAD) including methadone, morphine, codeine, methamphetamine, ketamine, midazolam and heroin were present in the urine specimens of 46 (24.2%) of 190 neonates. Eighty-one (42.6%) urine samples screened positive for other drugs, which include antibiotics, lidocaine and pethidine administered during delivery. Drugs were undetectable in 33.2% samples. Urine positive for CAD was independently associated with maternal history of substance misuse (p<0.0001), birth-weight <2.5 kg (OR 2.9, p<0.01), neonatal withdrawal symptomatology (OR=8.89, p<0.0001); but not with risk of preterm delivery. Logistic regression demonstrated that neonates with maternal history of substance misuse and CAD positivity were 5.99 (p=0.021) and 5.91 (p<0.0005) times more likely to have withdrawal symptoms. Conclusions: CADs are isolated in the CDS of nearly one-fourth of neonates. 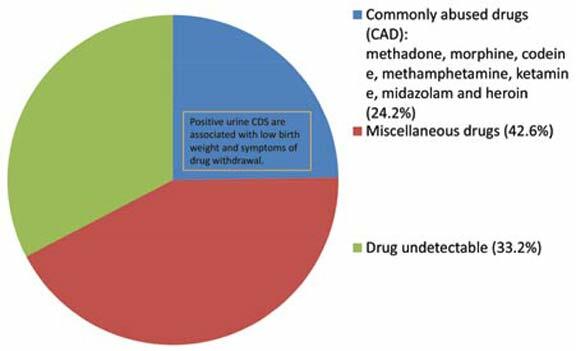 Neonates with maternal history of CAD exposure as evidenced by positive urine CDS are associated with low birth weight, and symptoms of drug withdrawal. Keywords: Comprehensive drug screening, neonatal urine, time of flight mass spectrometry, withdrawal, low birth weight, withdrawal symptoms, maternal drug abuse and neonatal outcomes. Affiliation:Department of Pediatrics, The Chinese University of Hong Kong, Prince of Wales Hospital, Shatin, Hong Kong. Keywords:Comprehensive drug screening, neonatal urine, time of flight mass spectrometry, withdrawal, low birth weight, withdrawal symptoms, maternal drug abuse and neonatal outcomes. Abstract:Objective: Maternal drug abuse may influence neonatal outcomes. We compared neonatal outcomes of patients with urine screened positive for commonly abused drugs (CAD) versus those who were screened negative, and reviewed the pattern of drugs detected at a university teaching hospital.